Audie Murphy’s name became synonymous with the western genre from this film forward. It’s Audie’s first oater and second starring role. He had previously headlined Bad Boy opposite Lloyd Nolan the previous year. He went from playing a juvenile delinquent in Nolan’s care to perhaps the west’s most famous delinquent. William Bonney aka Billy the Kid. 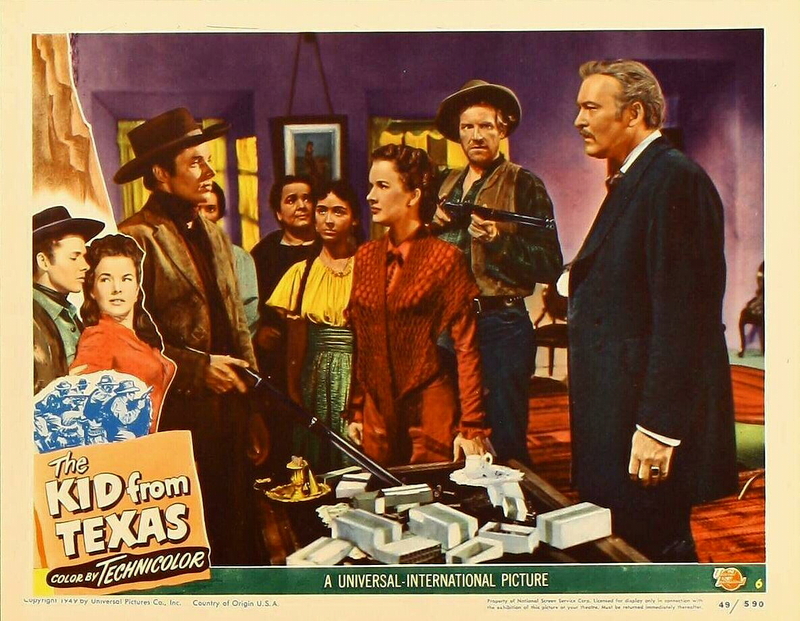 The story is told in a compact 78 minutes under the Universal – International banner for which Audie made numerous westerns in the ensuing years ahead. The central part of the story is similar to the other editions of Billy’s life told on screen. He’s a young hothead caught up in the Lincoln County War where a kindly rancher tries to help the young sharpshooter walk a straight and narrow pathway until violence steps in. Violence in the form of William Talman and three other riders under the command of Dennis Hoey. Audie’s not resting until the four men are laying across a saddle. Ray Teal and Albert Dekker at first try to get Audie to lay down the guns and accept clemency but when he refuses they turn on him and the wanted posters go up. The militia dispatches Sheriff Pat Garrett to the territory and if you know the story of Billy the Kid then you’ll know the significance that Garrett plays in the outcome of the Kid’s future. Garrett is played this time out by Frank Wilcox in what amounts to a very minor role. 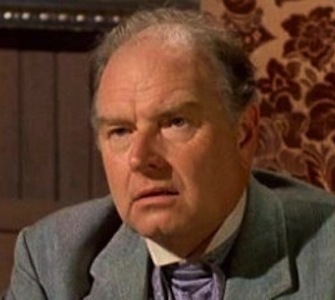 Along for the ride is Will Geer as Audie’s kindly oldtimer/partner in the Walter Brennan mold. He lives day to day with no worries other than looking after his young friend and protecting him from hangmen and back shooters. With Teal, Dekker and Talman in the mix he’s sure to be busy. Gale Storm stars here as not so much the leading lady but a woman who while married to the elderly Dekker feels that Audie has a life in front of him away from the violence and killings if he’d only heed her advice. She serves as a conscience to his troubled character as well as a love that he pines for that can never be. For just his first time out in a western it’s easy to see why he essentially became typed as a cowboy. Murphy is very impressive here in this “B” film and looks at home in the setting of the west. Black hat and leather jacket serve him well as they would in some other western features like Night Passage in 1957. Murphy was always a popular western star around our house growing up since Dad was a big fan thus passing the torch to me when it comes to the real life war hero. This version of Billy was directed by Kurt Neumann whose most famous film still lay in the future. In 1958 he directed The Fly. If you know your character actors then you’ll be sure to recognize the voice that periodically narrates this tale. It’s Parley Baer. While appearing in many features and television shows I recall him from The Andy Griffith Show where he played Mayor Stoner for a couple of seasons. After all Mayberry is where I’d really prefer to live. 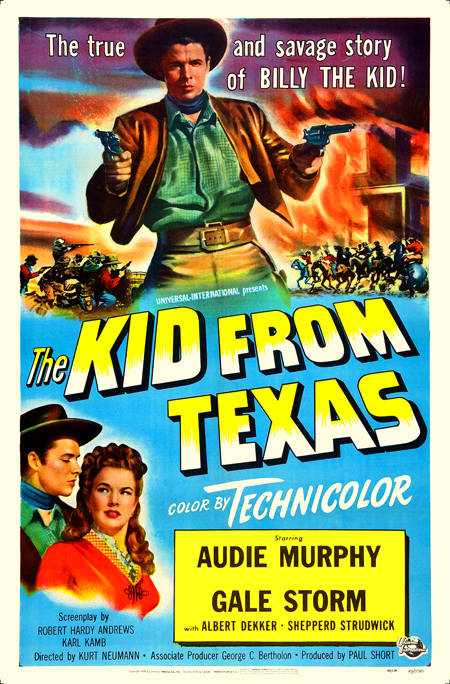 While no classic, this version of the kid’s story is a fine example of the studios output during the glory days of western cinema. I’m not so sure there really is a definitive version of the Kid’s story on screen. Paul Newman, Kristofferson, Val Kilmer and many more to check out if you’re so inclined. This film came up in conversation over at my place recently. Now I’ve never seen it, and heard some negative comments on it before, but a number of guys whose opinions I respect assured me it a worthwhile movie, and now you’ve added your voice in support too, Mike. I’m quite keen to see it as a result of all these recommendations – it’s part of a new Murphy boxset out in Germany. 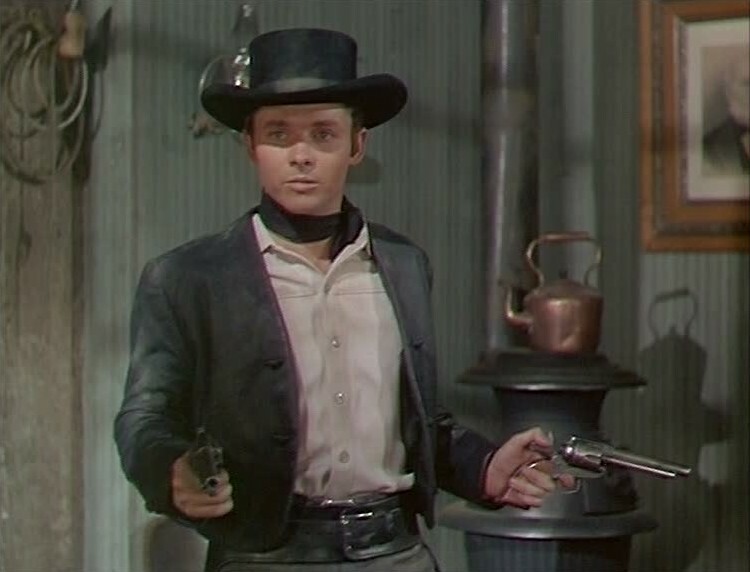 No classic here but the fact that it’s Murphy’s first western gives it some historical importance for us western fans.